Team Europe erupted in tumultuous celebration, but one of their number still had a simple task to perform before he could join in. Caddie Craig Connelly had been leaning on the flagstick on Medinah's 18th green watching his boss sink the putt that retained the Ryder Cup. Then his task was to return the pin to the hole and, while Martin Kaymer leapt into the arms of Sergio Garcia and was mobbed by his team-mates, Connelly turned to offer his hand to a disconsolate Steve Stricker of the US. This was the moment, two years ago, that Europe completed their comeback from the dead to maintain their grip on the famous trophy, which became known as the 'miracle of Medinah'. They'd trailed by four points going into the final day singles. "I think it was the ultimate," Connelly says of that magical moment in the Chicago suburbs. And now the man from Clydebank is looking forward to more of the same as a Scotsman at a Scottish Ryder Cup. The caddies perform vital roles for both teams. The players face unique pressures over the three days of competition and their faithful lieutenants provide crucial input to help them cope. "For us, it starts Monday when we get together - and then Tuesday, Wednesday and Thursday, it's the practice rounds," Connolly told BBC Sport. "It's very different. You do things that you don't normally do, like playing fourballs in practice; 18 holes as well. We caddies eat together and pretty much everybody goes off to bed at the same time." On tour, the caddies are at the constant beck and call of their players. The job is far more than shouldering their heavy bags. 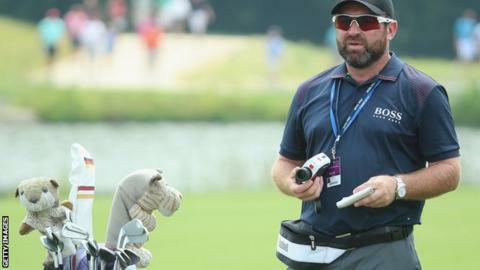 Caddies advise on tactics and club selection, provide psychological support, come up with travel plans and ensure everything is where it needs to be for their boss to compete without concern. At the Ryder Cup, the bagman's lot is made much easier. "There're 12 of us; we have a caddie captain and we have Julian (Phillips), 'the Ferret', who is a great help to us," Connelly said. "He is very much the backbone of our support. We have Julian at the hotel and in the locker room, and he makes sure that we don't want for anything. Whatever we need, he's there for us." Lugging the player's bag for 36 holes isn't as arduous as you might think either. Connelly added: "You can dump the umbrella and the waterproofs and whatever else you have in the bag, because during the fourballs and foursomes you've always got somebody with you. "There's a vice-captain and a driver, so you can offload every thing in the bag and so it's always pretty light. "It's a week like no other and the camaraderie is unique; you forge friendships for life. It really is something to savour." And that's even more the case this time for the Scot, whose fondness for team golf extends beyond the Ryder Cup. "I was very fortunate to caddie at the Solheim Cup at Loch Lomond on a course where I grew up caddying," said Connelly, who was working for Trish Johnson in 2000 when Europe beat the United States 14½-11½ to win the trophy for the second time. "That was a huge achievement for me - one I'll never forget. Great memories, especially the way the girls won it." Such experiences undoubtedly helped Connelly cope with the drama that unfolded on the final day at Medinah in 2012. "Martin's play going into it wasn't the best," his caddie admitted. "He didn't have all that much confidence in his game. He didn't play particularly well on the Friday and he said that he felt he let Justin Rose down. "And then to get dropped on Saturday was very disappointing. You're just cheerleading the whole day and it's very difficult." With Europe trailing heavily, Connelly admitted there was a slight feeling of 'what's the point' heading out in the 11th singles match against Stricker on that fateful Sunday. But Europe surged back and when their match embarked on the closing holes, they knew there was plenty at stake - the presence of skipper Jose Maria Olazabal reinforced the point. "Jose Maria came up up to Martin on 16 and put his arm round him and said: 'I don't care how you do it, but just get that point.' And I thought: 'Right, fair enough, OK, the man has spoken, so we've got to deliver.'" Ultimately it came down to that last seven-foot putt on the home green. If Kaymer sank it, Europe would reach 14 points and the trophy was safe. The image of the late Seve Ballesteros had been embroidered on all the European shirts, and it was that image that Connelly saw as the crucial putt approached. "I was leaning against the flag and I could see my left sleeve and Seve was there, so I looked up and thought, well, you're all around us," Connelly recalled. He had every faith in Kaymer, saying. "I actually said to someone before the Ryder Cup, the Germans are very good at taking penalty kicks so if it came to a six-footer for the Ryder Cup, I'd have every confidence in Martin making those putts all the time. "From reaching the green it felt like it took an eternity, especially those last seconds. "It's one of the most remembered celebrations in golf now, isn't it? Martin just running off to Sergio and leaving me in limbo to shake Steve's hand and put the flag back in the hole." Connelly smiled at the memory of being a part of such scenes, saying: "That was by far the most amazing experience I've ever had." This year, he has shared in Kaymer's victories in the US Open and Players' Championship. It would be fitting if Connelly could round off a stellar season by playing another instrumental role in retaining the Ryder Cup, and this time in his native Scotland.